DESCRIPTION Ash has a pronounced grain, the sap wood is creamy white the heartwood is a grayish brown the grain is coarse and interlocked. Weight ranges from about 35lbs to 41lbs per cu. ft. MECHANICAL PROPERTIES Bending properties vary, but are generally very good. It has good strength, toughness, stiffness and hardness for it's relatively light weight. WORKING PROPERTIES Moderate blunting effect on cutters, but can be worked fairly well with hand or power tools. Pre-drilling required for nailing in the harder Ashes. Stains, glues and polishes well. DURABILITY Ash is non-durable and perishable. The sapwood is susceptible to attack by powder post and common furniture beetles. Heartwood is moderately resistant to preservative treatment and sapwood is permeable. SEASONING Dries rapidly with little degradation. Small movement. USES White Ash is used extensively in sporting goods, bats, oars, pool cues, tool handles, cabinet work, high-class joinery, plywood, paneling and veneer. 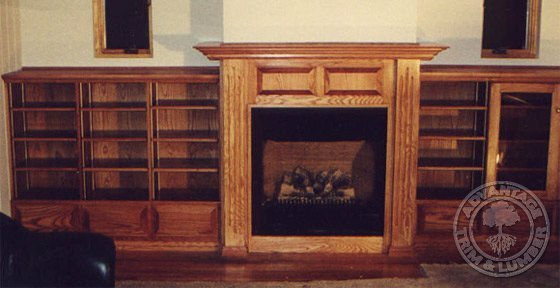 Above: Ash wood bookcase/fireplace surround built by Rob Pelc. Ash is similar to Red Oak just lighter in color. It also has a more pronounced cathedral grain pattern. Do You Have Tips or Techniques For Ash Lumber? Leave them BELOW. Also great for rockers on Rocking horses won't crack (like oak (has a tendancy too))! Species: Ash [Brown or White] makes excellent longbows. Species: Ash Its great for making toboggans to!